One of the big advantages of seeing the Xperia X10’s bootloader bypassed (apart from the ability to load custom ROMs) is the removal of the FPS cap that has been set by Sony Ericsson. We’ve attached an interesting video that shows this difference in action, where the user has two X10’s – one running on the Custom FreeKernel Alpha1 (i.e. cracked bootloader) and another on the Froyo CM 6.1.3 ROM. He runs several benchmarks between the two and it’s interesting to note the difference in FPS rates in some (not all) of the benchies. Check it out below. beat this SE. u dare? gays! freakin morons! !!! Can we download it yet…? does anyone knows how to reset the “Network counter”? i have the code and i want to unlock my X10 but there’s not attemps left to… i’ll appreciate your good answers. thanks for read this comment! 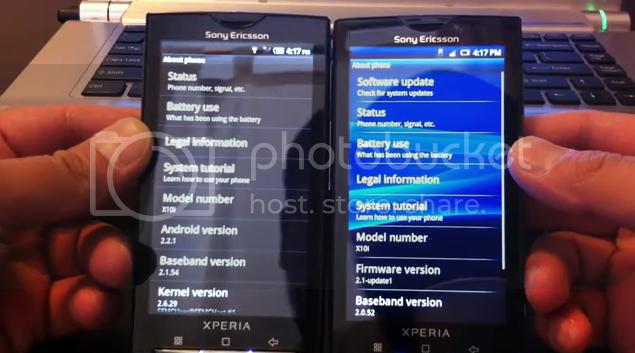 does the xperia x10 actually supports 16m colours?? If you absolutely want a new phone, might I suggest the Morotola Atrix, it looks to be one of the best handsets at the moment. Or you could wait until summer, I hear there is a lot of real powerhouses to be released. Try xperia arc or play. Don’t listen to those SE haters trying to tell you not to buy any of the xperia line. They are those kids who were not given candies even though they cried their asses out. please let us know how we download perfect 2.2.1 for x10? now i confused with multipal rom and multipal thread please xperia.net ppl help us…..
Rina@ are u using one? mine is restarting 5-10 sec after the phone is booted, can somebody help? I am using x10 fyi. So i have the right to be here. Maybe you are a SE hater. Are you mad because SE screwed you? This guy is not so smart, actually not smart at all judging by the fact started to make the video with the 2nd phone nearly empty. I mean, come on, he could have at least charged it a bit. Also, the 2nd phone is not in the wireless network while the 1st one is connected. Just pointing out some weird approaches he took. You mean the moto’ atrix with the locked down bootloader??? SE have said they’ll be releasing their latest line of xperias with an unlocked bootloader (at least in Europe, anyhow) so I fail to see why people wouldn’t buy a play, neo or arc. @André: “FPS Cap”: all applications are limited to 32fps on the phone. No matter what you do, what application you try, the fps of any animation won’t go over 32fps. @eric: I guess not, as it’s in the very early stages. We have to wait a few days/weeks before it will be ready for day-to-day usage. But it will be done before SE’s update. And that’s the best of all! @Darth Glacious: zdzihu’s version is probably not on the network, since it’s an early alpha build. Please remember, this is in a testing phase and not ready for day-to-day usage. Why does everybody think, that this is a finished/polished product?!?! Be thankful for the developers, that they’re making it possible. And if you can afford it DONATE them! But what’s the reason to SE limit all apps to 32fps? Save battery? The best improvement to my X10 was done by disabling mediascanner. No more reboots, no lag, no start up delay, the phone runs perfect now with 2.1, minus all the junkware that was also removed. When Mediascanner is turned on, my phone was rebooting multiple times a day (I suspect the processor overheats as it scans the 16GB SD card so frequently, randomly, and for no point at all). After I disabled it, my phone has not rebooted a single time for 2 weeks now. To disable mediascanner, you need to download the “Rescan Media” app. Note, the phone must be rooted. Also note that some apps that rely on the Anrdroid Mediascanner may not funtion properly. With Rescan Media, you can turn it back on. Do not remove the mediastorage app as I had issues with media browsers when I did that. Nope they meant all Android Xperia’s starting with Arc and onwards, leaving out just X8/10. YAY XDA, and F-U Sony Ericsson. I bet they must have had a hunch that the bootloader had been cracked so they decided to announce the Gingerbread update. XDA you are all my heros!!! Thanks for showcasing my video on XperiaX10.net! Love this site, check it all the time. @Darth Glacious – Thanks for your kind comments about my intelligence. I actually make these videos for fun so it doesn’t really matter what you think. I definitely do need some polish on how I present things, but I generally just wing it. 1. Don’t need much battery life to do a 7 minute video do I? Purpose was to show FPS differences on each phone. Maybe I should have compared the custom kernel to a stock 2.1 instead of another ROM but didn’t because I didn’t want to reflash the other device. Also, when flashing different basebands, as well as wiping battery stats when flashing, takes a lot out of the battery. But again, my purpose was FPS not to show the battery stats. 2. Both phones are connected to the internet. The one on the left was connected to wifi because I don’t have two working sim cards. The one on the right was connected to a AT&T’s mobile network as you can see by the H symbol that appears on the top right corner. Plus, in order to get quadrant scores you have to be connected to the internet (I have the free version). As you can see, when getting the quadrant scores it takes awhile for the phone on the right to get it. Maybe I should have connected both X10s to wifi, but does wifi affect the FPS? Sorry about my weird approaches. Maybe you know something I don’t, but I didn’t think battery and wifi affected FPS. Let me know if I’m wrong. You should put the cyanogen mod on the phone with the cracked bootloader aswell. the fps cap was gone but you still had stock sony software on there which slows down all the intense stuff you do with the phone. like benchmarks. thats why quadrant gave you a 793. which is a very high score for stock sony software! with the cyanogen mod it would beat the 1297 your other phone got. @Daniel Mount – Unfortunately, to my knowledge, the custom kernel only works on a clean 2.1 compatible with baseband .52. I tried to install the custom kernel on CM7.0 because it was compatible with bb .52 and to test if it would work. However, the phone wouldn’t boot past the white Sony Ericsson letters. CM7.0 will be coming out soon with a custom kernel that overclocks the processor to 1.1ghz. Not sure what other restrictions will be taken out though. I cant believe all these moaning idiots here. excuse my french. First of all the video shows what has been made possible (bootloader crack and fps) which is great, wanna see all those moaning bastards archive what he managed to do. Also xperia x10 was not great with 1.6 and now with 2.1 its much better, now they even go with gingerbread…so why moan and moan and moan. maybe keep your stupid comment for yourself until you archieve something usefull where the world can write about. Nice video Sopdogg – ignore all the haters. Until you try and make a video yourself you realise that it’s no easy task. Can someone please explain the difference between a generic and branded x10? This reminds me of the PC FPS benchmark junkies. I believe that the 32 FPS limitation is a good thing, and was frankly impressed to see that Sony had done this as it is quite a clever thing to do. Let me quantify why… I dont know what the hardware spec is on the LCD but you probably cant get much more out of it, and if you can, you probably wont be able to see it(depend on the display redraw time). All those benchmarks are completely synthetic. The first one for example wants to draw 1000 frames and draws them as fast as possible so the app seems to run faster on the unlocked phone. In reality the application should be coded around a timer and not around displaying every frame, that way both phones will run the application in the same time even with different scores but arguably without any visual difference. The reason this cap is a good thing is that if you have a properly coded application, it will generate a frame dump it to display and generate the next frame then wait for the refresh to dump it before generating the next one. during this wait the application is idle and you are saving battery life. This is oversimplified as many applications double or tripple buffer to improve performance but once the buffer is full youre back to waiting and saving power. On phones, performance is everything, but a distinction needs to be made between performance and speed. Performance means application responsivenes, battery life, and display smoothness. Using FPS as a performance metric is silly, especially if you cant even display or see the extra frames in the real world. I cant believe people put so much credence to synthetic benchmarks and slag Sony who have actually done us a service (I refer to manu here specifically). Just because some benchmark widget shows you 1300 vs 800 you go off on your little tirade without actually contemplating the facts presented. Think before you speak and then just for good measure think again. Thanks to Sony for a well thought out product offering and thanks to soapdog for his efforts in making the cool video comparison.